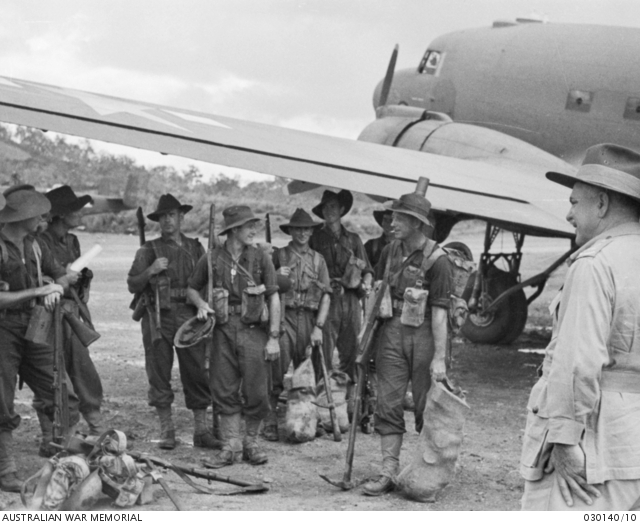 2 July – MacArthur decided to secure the Papuan Peninsula and land 3,000 additional Australian troops, but the enemy had moved faster. Operation Providence for New Guinea could not now be rushed. Only a few hundred native militia and one company (500) of the 29th Australian Infantry stood in defense from a powerful enemy. 4 July – American submarines torpedoes 4 enemy destroyers around the Aleutian Island in Alaska; 3 at Kiska and one at Agatter. 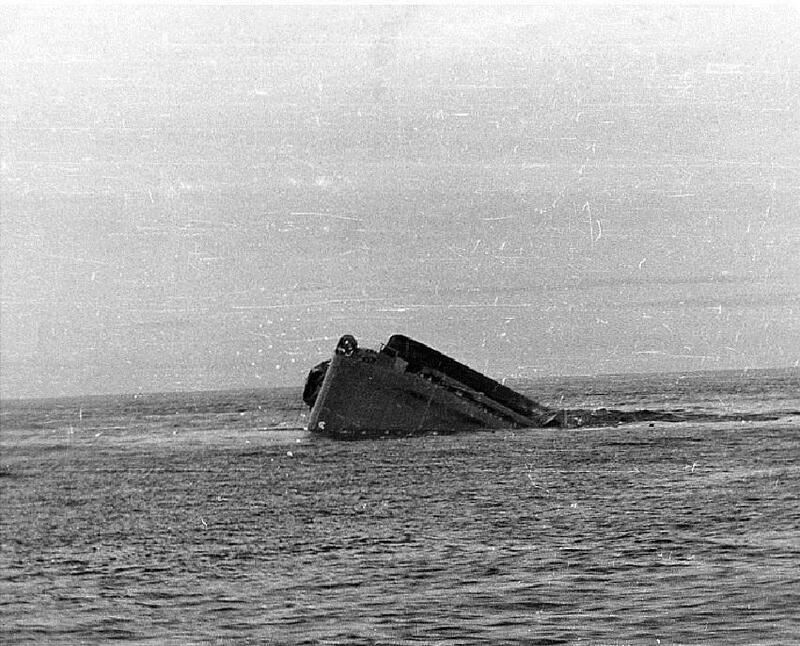 Three of the Japanese vessels sank. 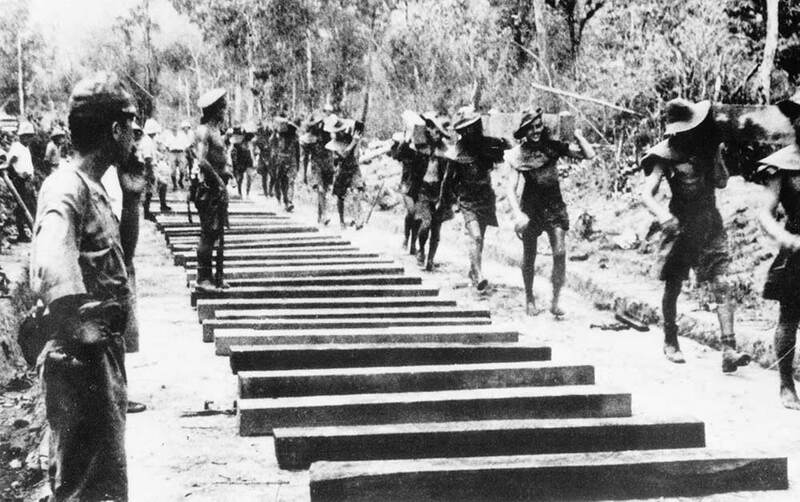 7-12 July – Australian troops made a five-day march across the Owen Stanley Mountains in southern Papua, New Guinea. 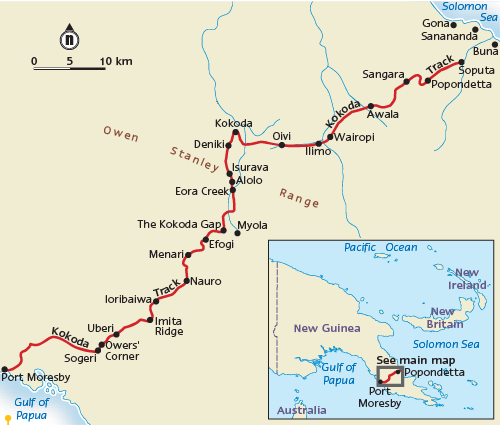 They set up defensive positions along the Kokoda Trail which snaked from coast to coast. 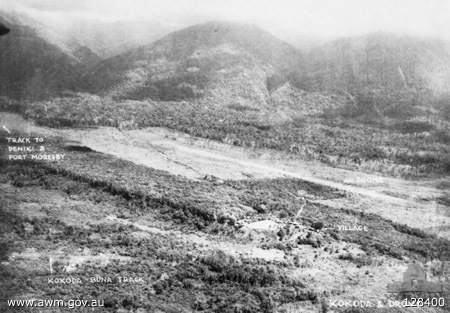 21-29 July – the Japanese 18th Army landed at Buna, New Guinea on the northern coast of Papua in a renewed attempt to move across the Owen Stanley Mts. and take Port Moresby. Under MGen. 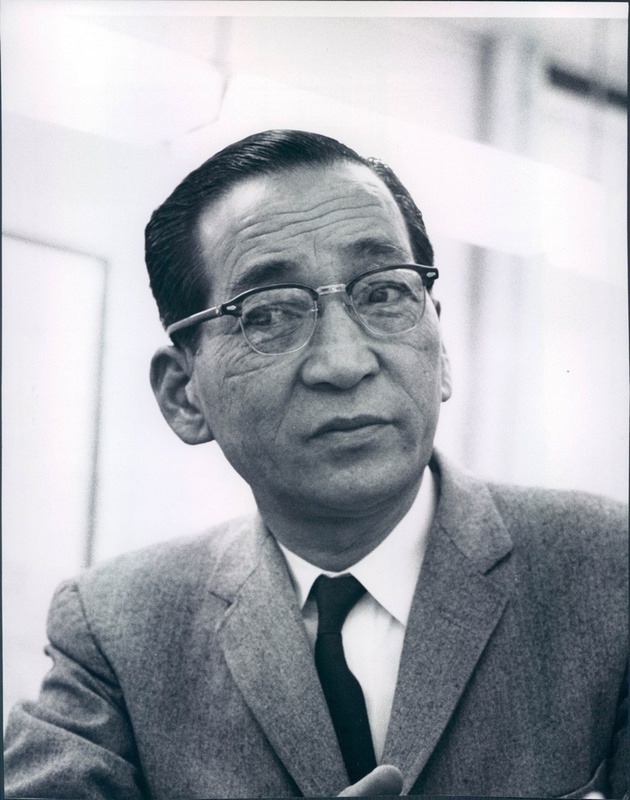 Tomitaro Horii, 13,000 troops and 1,000 bearers, in his South Seas Force, marched in for a surprise attack. 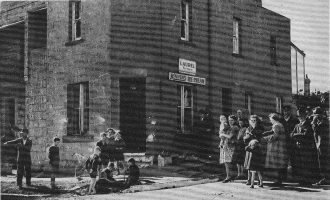 Should this operation be successful, Port Moresby would become the launching site for the bombing and invasion of Queensland. The impossible conditions of this territory would be the site of some of the bloodiest and most desperate fighting of the entire war. 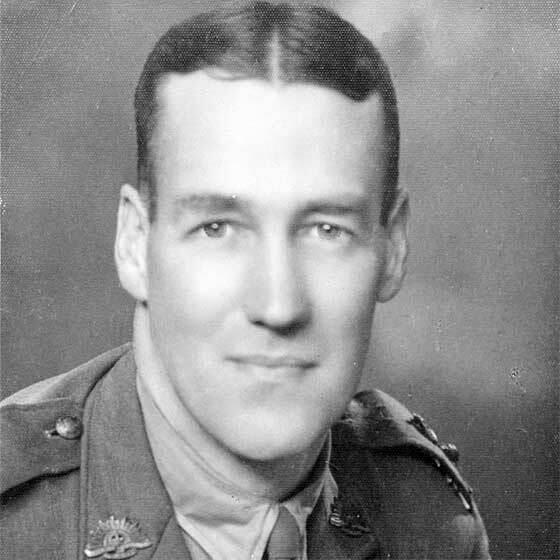 Australian commander, Lt.Colonel William Taylor Owen, 39th Battalion, of Leongatha, Victoria, lost his life during this battle in the mountainous, rain-soaked jungles along with many of his men. Owen was taking part in close fighting with the enemy in the most forward position in Seekamp’s sector, on the very lip of the plateau. He was throwing grenades when a bullet struck him and he died on 29 July 1942, aged 37 years. 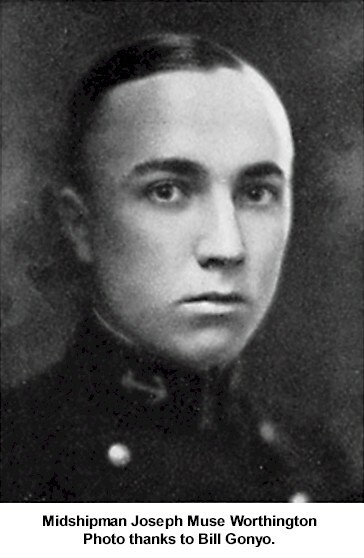 Owen was the first Australian to receive the American Distinguished Service Cross. MGen. George C. Kenney arrived to take over the Southwest Pacific Forces Air Command of 245 planes of which only 50 were serviceable. He too would share in the discomfort of the territory where the poor diet of MVs (canned meat and Vegetables) would cause his flyers to lose about 30 lbs. 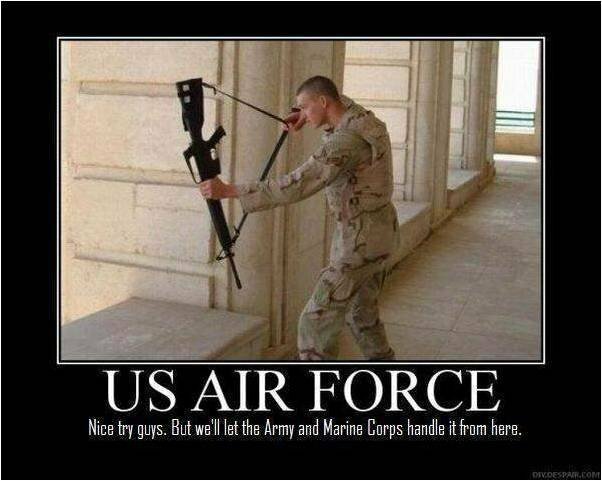 in a single tour of duty. Malaria began to break out. 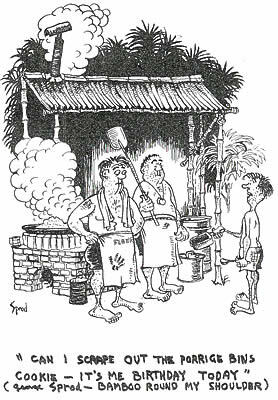 But the men still had a sense of humor and joked about the “New Guinea salute,” the constant act of swatting away the swarms of black flies. Countless films and books concerned with the Second World War have, through the decades, concentrated on Europe and the Holocaust and the Far East prisoners of war have barely been mentioned. The official 5 volumes of British history for this war include only 10 pages devoted to the subject, compared to the Australian history with 170 pages. 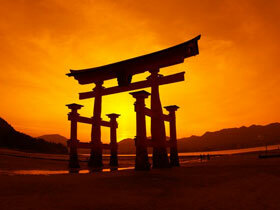 Japan’s army conquered the Far East in 1941-42. Prisoners were taken from Singapore, Hong Kong, Malaya, Thailand, Java, Sumatra, Ambon, New Britain, Celebes, Guam and the Philippines. According to the Tokyo War Crimes Tribunal, Japan took more than 50,000 British and Australian troops in Singapore alone; 42,000 Dutch (N.E.I. ); 10,000 British in Java and 25,000 Americans in the Philippines and then transported to the mainland camps. The Japanese government made its position known in 1942, through its legation in Bern, Germany. 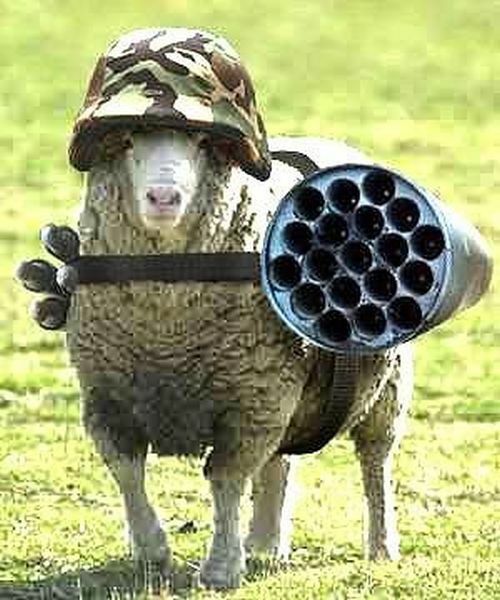 They felt they were not bound by the Geneva Convention, but it would apply the rules as far as it was possible – mutatis mutandis (with necessary changes). By Japanese standards, the men who were captured had shamed themselves; they were contemptible, expendable and “white.” But, the Japanese treated their own soldiers as badly as the prisoners. 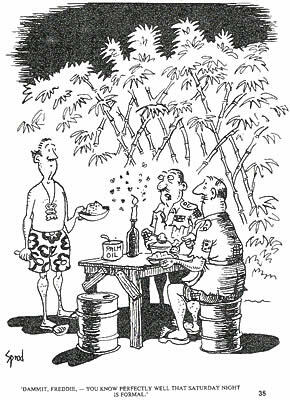 Although most every rule of the Geneva Convention was broken, not every huard was cruel and not every camp a hell-hole. 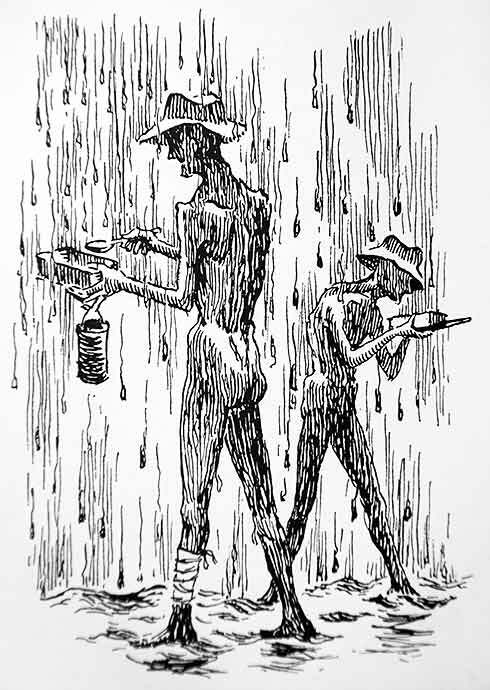 Australians, rice in the rain, by Ray Parkin, Fepow, Australian Army. Generally, the prisoners conformed to national stereotypes. The British tried to preserve the class system, with the officers maintaining their privileges. 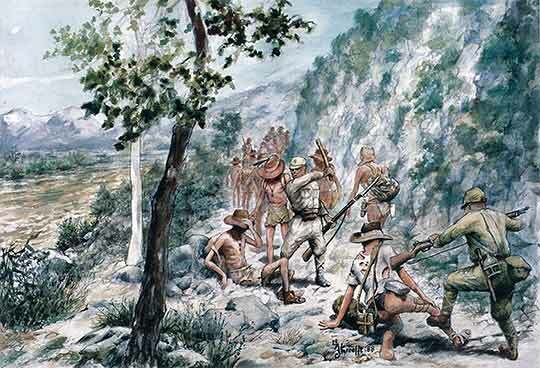 The Australians were generous to their “cobbers,” but where also considered the most skillful at robbing or tricking the Japanese. The Americans were the most entrepreneurial, but some of their rackets were worthy of the Mafia. 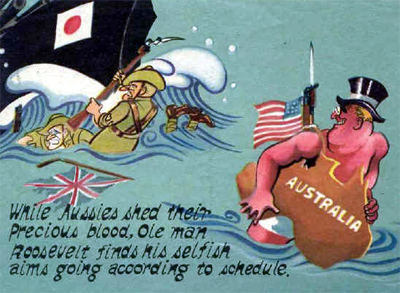 The Americans offended the Australians because of their ignorance about other countries and an unsubstantiated superiority complex and they made insulting remarks about the menial status as a pawn of Britain. The Americans in turn found the Australians smug, opinionated and inexplicably fond of monarchy and pageantry. Both saw the British as arrogant, stiff-necked, inflexible and acting superior. 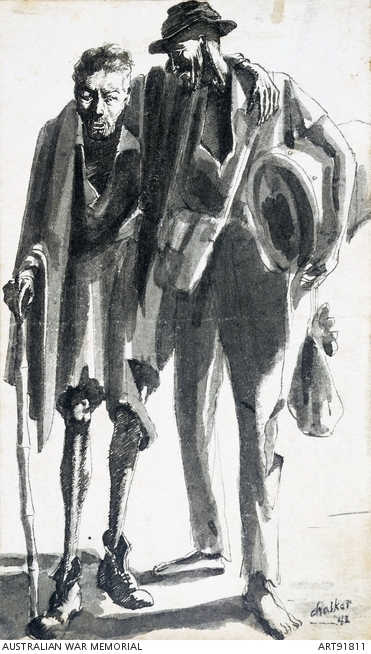 For most Britons, the war ended on VE Day in 1945 – the soldiers still fighting in Burma became the “forgotten army.” That made the Fepows not only forgotten, but forsaken. It would take them more than 50 years to receive any proper compensation from the British government. Being as most of the POWs of the Pacific and CBI were in captivity until 1945, further accounts will appear throughout this series. Dammit Freddie – you know perfectly well that Saturday night is formal! The result of the Battle of Midway was a definite shift of balance of naval power in the Pacific. The Japanese Combined Fleet of 145 ships burned more fuel for this operation than the entire Imperial Navy had used in the previous year – they could ill afford to do that again. 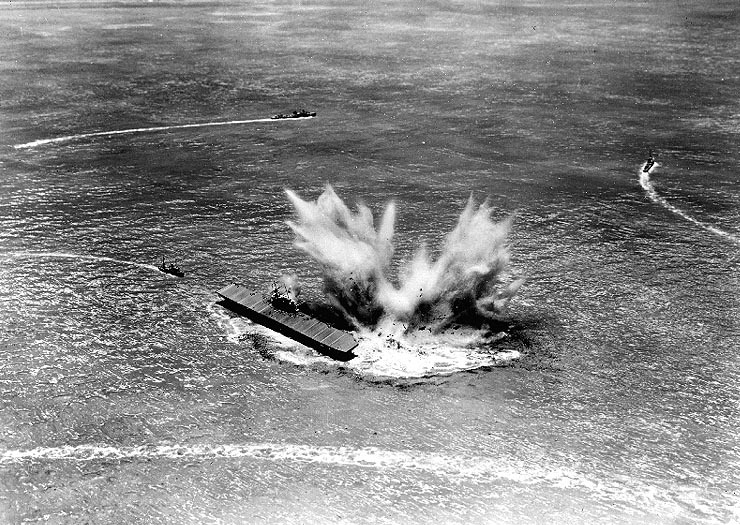 The Japanese had lost 4 carriers, one cruiser, 234 planes and 2,200 men KIA [ other resources list up to 292 planes and 2,500 KIA]. 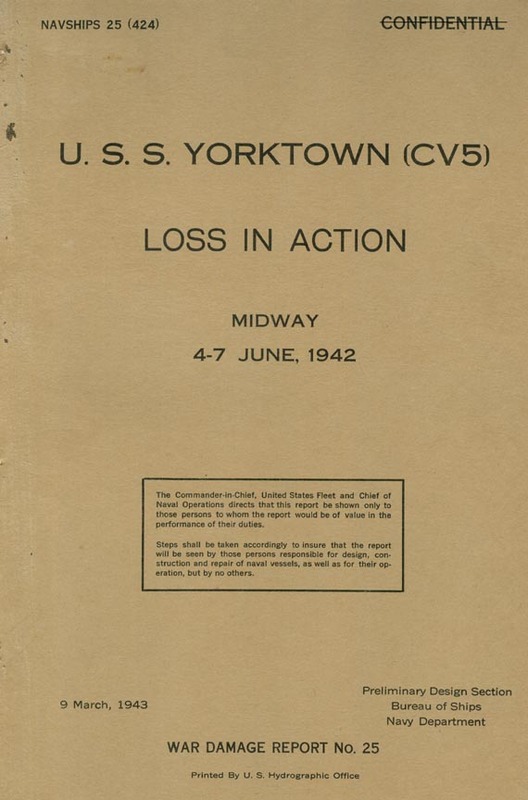 The Americans had lost one carrier [Yorktown sunk by sub I-168], one destroyer, 145 planes and 305 KIA. 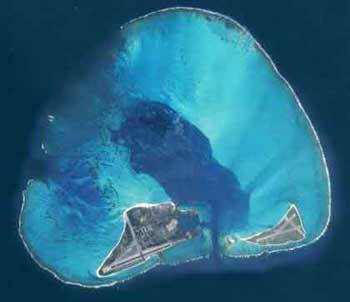 All this for 2,000 acres of Pacific coral. 5 June – a large convoy of British troops and war matérial safely arrived at India. The British ship Elysia was not so lucky to avoid the enemy raiders operating in the Indian Ocean and sank. 8 June – Australia received more attacks. 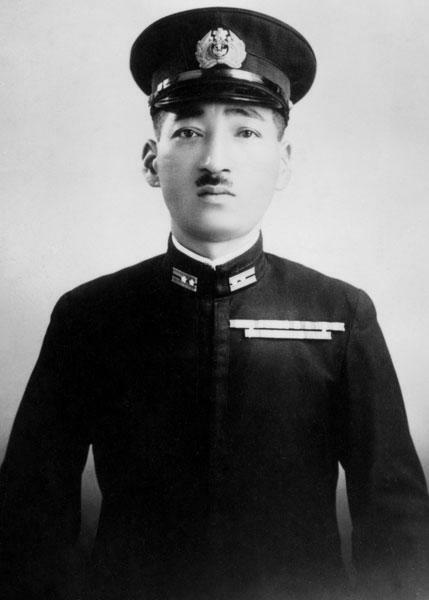 New Castle was hit by submarine I-121, under the command of Matsumura Kanji, luckily only one house was damaged. Fort Scratchley, Sydney was attacked by sub I-29, under the overall squadron leader, Hankyu Sasaki, but inflicted no damage. This attack ended in failure for both sides as the competence of Commander Muirhead-Gould came into question. 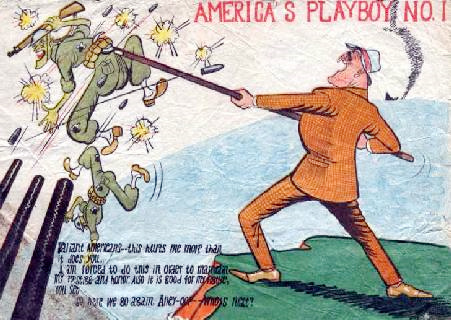 20 June – FDR and PM Churchill engaged in a meeting whereby they decided to pool both of their nation’s efforts and pay whatever price was necessary to develop the atomic bomb. The British Tube Alloys Project had already proved that such a weapon was feasible, but Great Britain wanted the US industrial and financial resources to develop it. Within 2 months, the multi-billion dollar technological effort, disguised as the Manhattan Engineer District was set up with unlimited and top-secret funding. 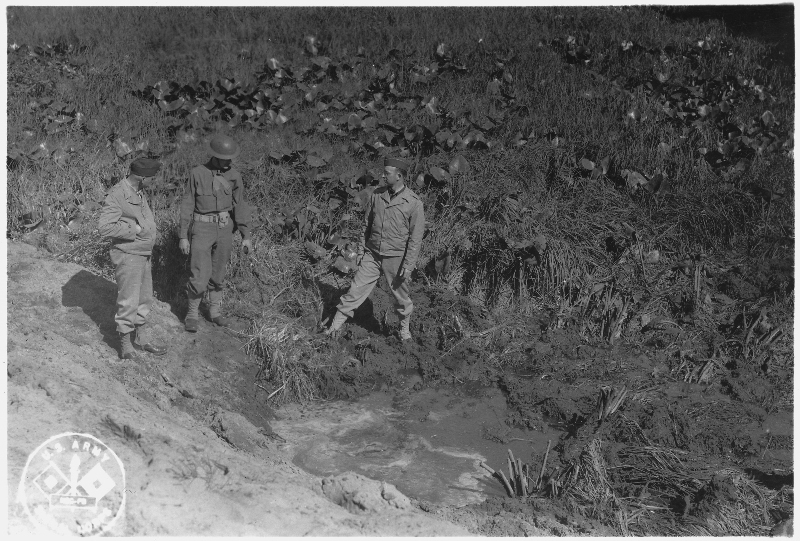 21 June – Fort Stevens, on the Oregon coast, received 17 shell firings from Japanese submarine I-25, manned by Tagami Meiji. The fort commander had ordered a black-out and no return fire, leaving the enemy with no target to aim for and the shells went awry, no damage reported. 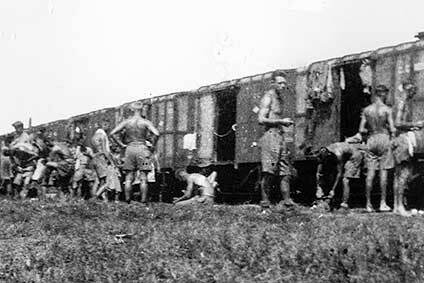 24 June – 600 Allied POWs and Asian slave laborers began work on an extension of a railroad line [the Burma Railroad] in between Thanbyuzayat, Burma and Nong Pladuk, Thailand. This was intended to give better access to shipping through the Gulf of Siam for the Japanese. The route was 200 miles (321 km) of mountainous jungle area with temperatures 100°F or more and usually 100% humidity. Disease without medical attention became a major issue. In all, the Japanese used 61,000POWs and more than 270,000 Asian slaves. They lost about 12,000 POWs and 90,000 others due to the beatings, executions, torture and the brutal 14 hour work days. The infamous bridge that crosses over the river Khwae Yai at the town of Kanchanaburi, cost an average of 425 deaths per mile to complete and did NOT significantly improve the enemy’s logistics. The bridge was later destroyed in 1944 by Aerial bombings, rather than Hollywood’s memorable epic film version, “Bridge Over the River Kwai”, which was only loosely based on the facts. By the end of June, the Japanese had abandoned their plan to assault Samoa. It was by which they had hoped to further harass Australia, but the Allies at the time, had no knowledge of this change in enemy plans. The photographs you’ve seen and know so well came from the heroism of this man! 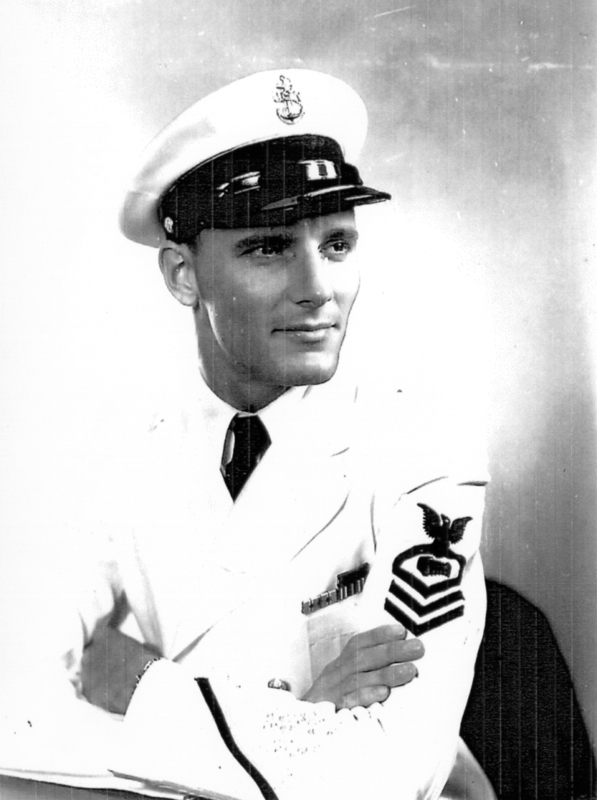 Bill Roy was a 21-year-old photographer’s mate aboard the aircraft carrier USS Yorktown when she was sunk by an enemy submarine at the Battle of Midway June 7, 1942.Midway was the defining battle in the Pacific Theater during the first six months of World War II. 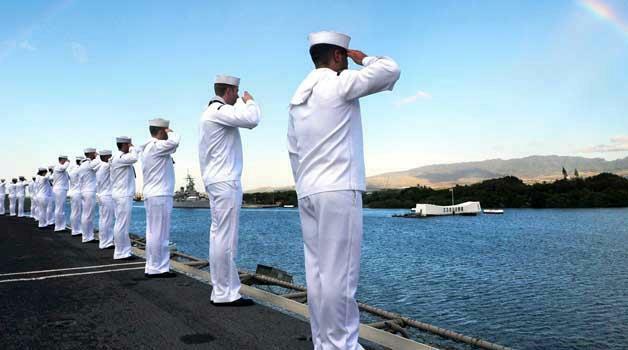 The United States went to war after its Pacific Fleet was bombed by the Japanese at Pearl Harbor on Dec, 7, 1941. At Midway the Americans sealed the fate of the Japanese Imperial Navy and ultimately stopped its westward expansion. RAdmiral Joseph M. Worthington, commander of the USS Benham (DD-796), describes the efforts of his ship at the time of the USS Yorktown‘s attack. This is condensed from the oral history in the “Pacific War Remembered,” by John Mason, Jr.
“The Benham was on the side bearing the brunt of the attack and was shooting with everything she had. One 5″ shell from the Yorktown went through the Benham stack and killed one of our officers and wounded others. There was no way to dodge the shells of our carrier as she fought in desperation. The attack lasted roughly 10 minutes and the Yorktown took a strong list. “The captain of the Yorktown gave an order to abandon ship, officers and men slid over the side, climbed down nets and went into the water. We and two other destroyers tried to pick up as many as we could from the water. The commodore ordered us to pull out and send other ships in, but there were too many survivors in the water around our propellers. We had taken aboard about 725 survivors – we had far more than capacity, but if there are people in the water you have to pick them up… including a fighter pilot, while we were steaming away. He was some distance from the Yorktown and just by the grace of God we spotted him. “I must say that the Portland sowed what a ship can do when the crew is properly trained. They not only handled the breeches buoys, the stretchers and the ambulatory cases, but they also launched and recovered planes for antisubmarine patrol… they were able to get the planes in the air and then pick them up by what they called the dog method, on a sled – all going on simultaneously. 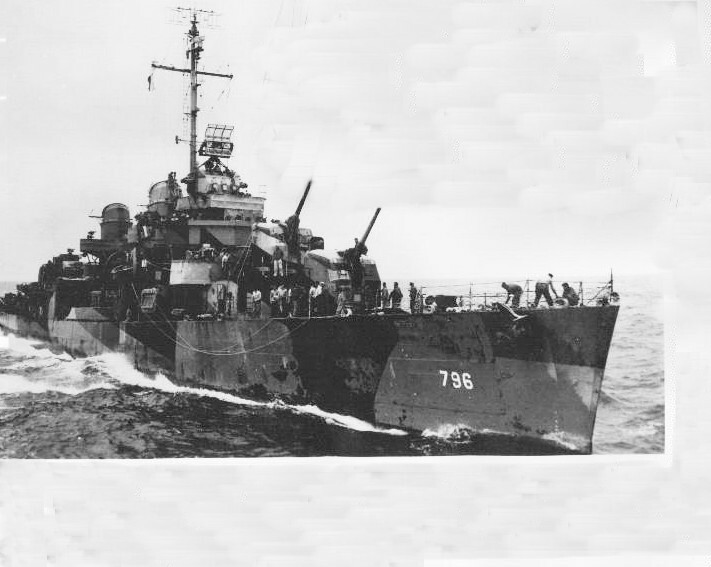 “The Yorktown was in tow by the fleet tug Vireo when the Benham returned. The Hammann was alongside powering salvage pumps and lights and 6 destroyers provided a circular screen. Then reports came in that torpedoes were on the way. When we got around the bow, we saw the Hammann sinking fast… We were ordered to attempt rescue operations. 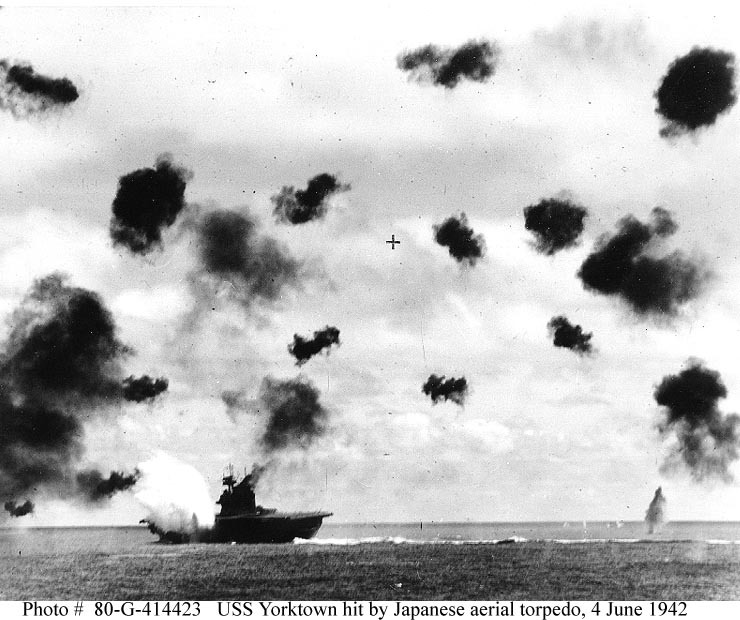 At least 3 torpedoes hit the Yorktown. They had gone under the Hammann and when they exploded on their target, depth charges and torpedoes on the Hammann blew. “We had no life rafts left, no boats left… The only thing to do was put men in life jackets and use lifelines. This time we recovered nearly 200. “I reported to the commodore,’Urgently recommend taking these survivors to Pearl… I believe we can save some lives.’ He didn’t hesitate, but said, ‘Proceed.’ Of course every bunk in the ship was used as a hospital bed. Everybody on board helped with first aid and looked after the wounded. Adam Koczrowski (29) – Denham Springs, LA; USMC, SSgt. 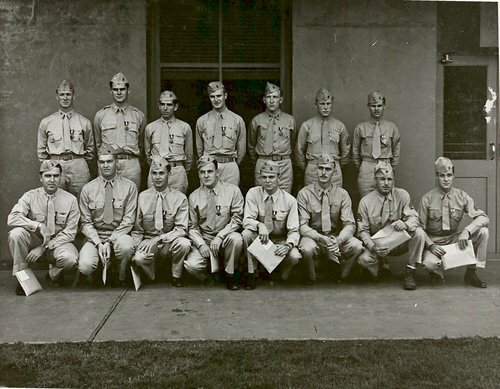 Front row L-R – Richard Blain, Leon Williamson, Daniel Cummings, Allan Ringblom, Harold Schlendering, Sumner Witten, Frank Zolnis, Gordon McFeely. Second row – William Humbard, Jack Cosley, George Koutelas, George Lumpkin, Clyde Stamps, John Moore, Charles Cayer. “Upon arrival, 27 May, at the island, we were greeted by remarks indicating that we were just in time for the “party.” These remarks didn’t bother us; we had just left the States two weeks before. Next morning, at squadron briefing when Major Henderson also let us know that the Japs were overdue — we did a little more thinking on the matter. 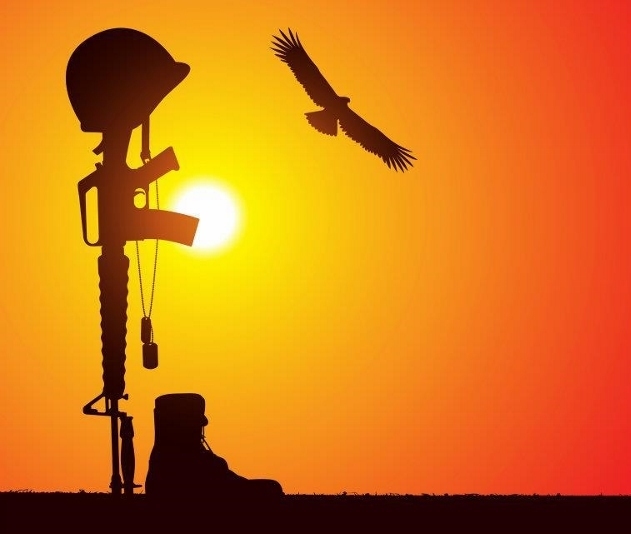 “The greenest group ever assembled for combat included Second Lieutenants George Lumpkin, E.P. Thompson, George Koutdas, D.L. 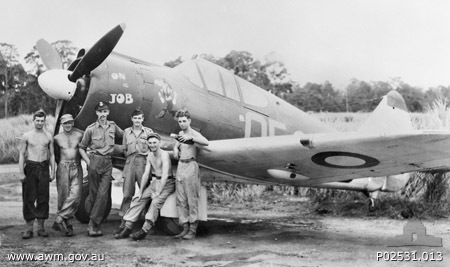 Cummings, A.H. Ringblom, Jack Cosley, Ken Campion, Orvin Ramlo and James Marmande. None of us had ever flown the SB2U, so we immediately checked out with no more trouble than a couple of ground loops. 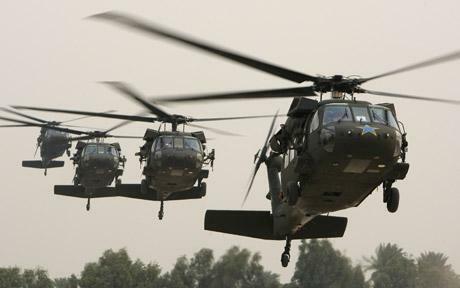 “On the morning of 4 June, after an 0200 reveille, we were all at standby and had warmed up the planes. Finally a runner came by in a jeep and verified the attack order. By 0605 we were all in the air. Capt. Prosser returned with a loose fuselage panel so I assumed his lead position in the second box. By the time we were rendezvoused, the Jap’s attack had fired a fuel storage tank, which served as a guiding mark throughout the day and night. “It was a quiet, uneventful trip to meet the enemy… The amazing nonchalance of Zero pilots who did vertical rolls right through our formation was a good show –very good for us since more attention to business might easily have wiped out 11 of the slowest and most obsolete planes ever to be used in the war. 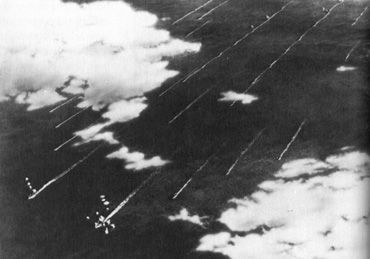 “With the interception at 13,000 feet, the clouds became our haven and Major Norris led us without loss to the target… The AA was heavy, but to one so ignorant of its destructive powers – not too bothersome, just curious. I received identical holes, about 6” in diameter, in each aileron. “On release at 400′, I pulled out right over the cruiser and was headed for the center of the fleet. One turn to join two buddies at 240 knots convinced me it was no place to circle; a Zero passed right behind as I whipped into a light turn. I headed home. I stayed below 50′ for about 20 minutes, in a straight course, only luck making harmless the numerous passes made by the Zeros. My gunner later told me he was too busy shooting to even inform me of the situation, and I was too scared and ignorant to turn around and look. “The radio failed, as radios were wont to do. I used good judgement then, for the first time that day, and turned 180 degrees. As luck and poor navigation would have it, by 1100 I had sighted 2 lagoons, and mentally flipping a coin, chose the one to the right – how right I was! Within 10 miles of the reef I ran out of gas. I attempted to get the life raft loose, to no avail. Then I found I could not replace the pins holding the bucket seat. So I was faced with a water landing in a loose seat. For those of you who found the Japanese point of view interesting, you might want to look HERE! 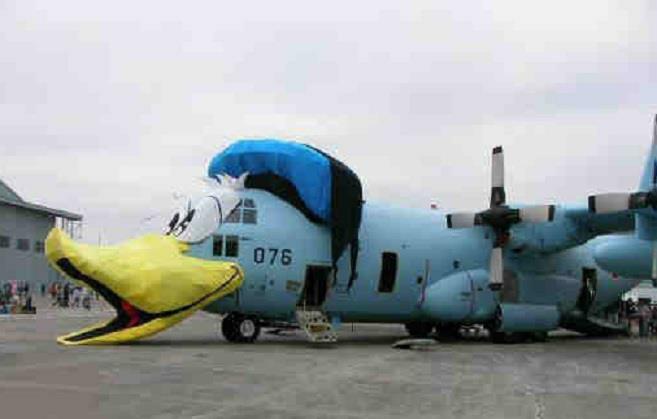 Military Humor – These guys have FAR too much time on their hands!! 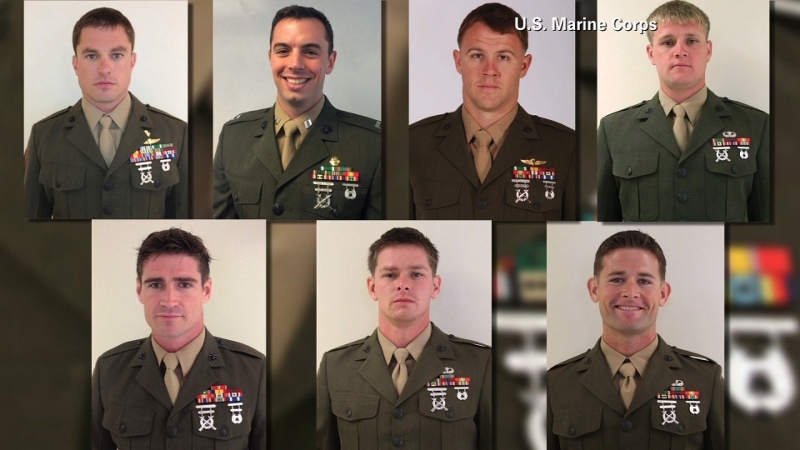 Trevor Blaylock (29) – Lake Orion, MI; USMC, 2nd Special Operations Battalion, SSgt. 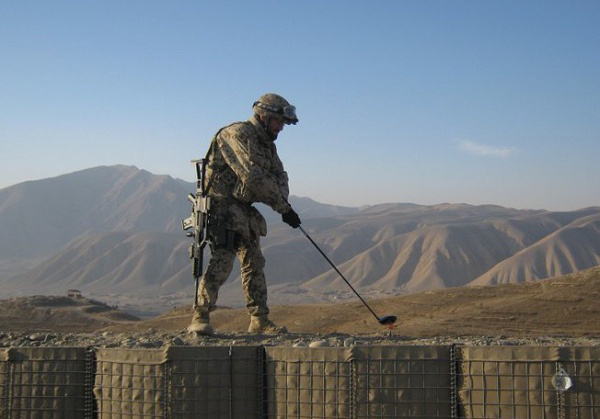 Liam Flynn (33) – Queens, NY; USMC, 2nd Special Operations Battalion, SSgt . Kerry Michael Kemp (27) – Port Washington, WI; USMC, 2nd Special Operations Battion, SSgt. Thomas Sanders (33) -Camp Lejeune, NC; USMC, 2nd Special Operations Battalion, MSgt. 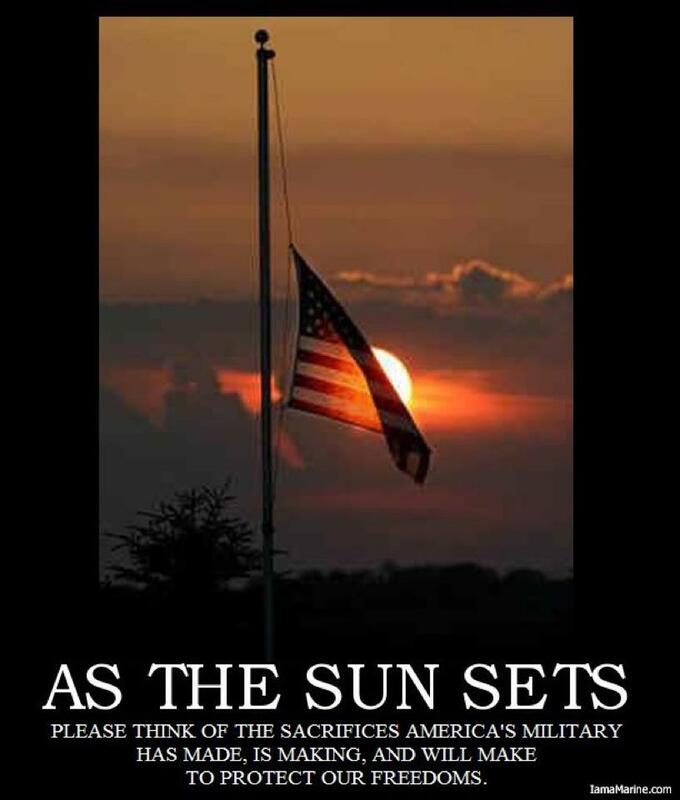 Stanford Henry Shaw III (31) – Baking Ridge, NJ; USMC, 2nd Special Operations Battalion, Capt. 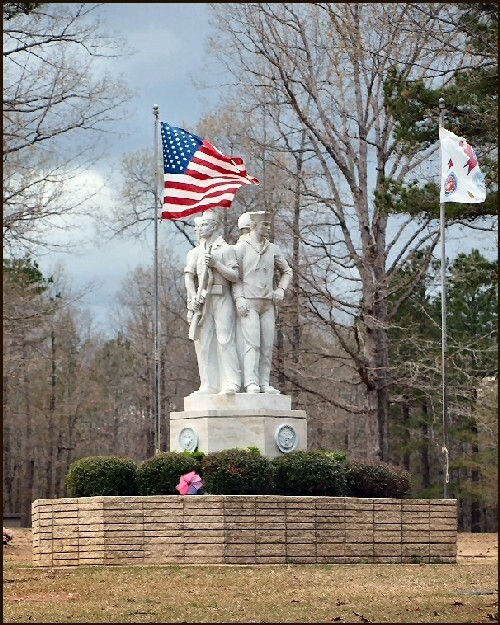 AN OUTSTANDING STORY THAT I UNFORTUNATELY MISSED.MAJOR HAROLD SLINGSBY (11-17-19 TO 10-12-2004), IS LAID TO REST AT PINECREST MEMORIAL PARK, SALINE COUNTY, ARKANSAS IN THE VETERAN’S FIELD OF HONOR. “The raiders closed in from both sides, barely skimming over the water. Flying in single columns, they were within 5 miles and seemed to be aiming straight for Akagi. I watched in breathless suspense, thinking how impossible it would be to dodge all their torpedoes. But these raiders too, without protective escorts, were already being engaged by our fighters. 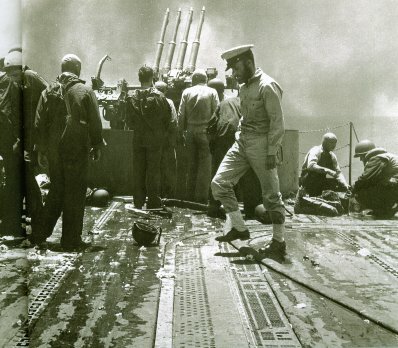 On Akagi’s flight deck all attention was fixed on the dramatic scene unfolding before us. “Of the 14 enemy torpedo bombers which came in from starboard, half were shot down and only 5 remained of the original 12 planes to port. 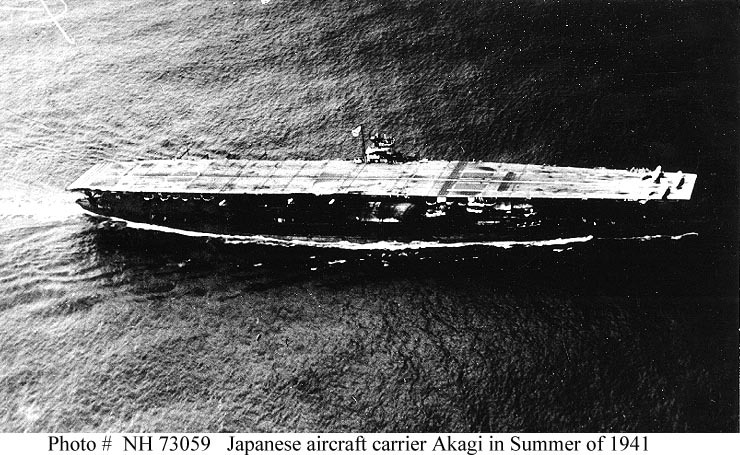 The survivors kept charging in as Akagi opened fire with antiaircraft machine-guns. We watched for the splash of torpedoes, but most to our surprise, no drops were made. 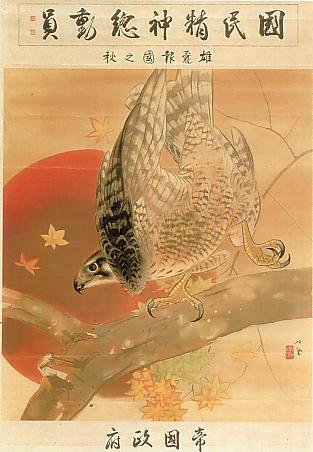 At the last moment, the planes appeared to forsake Akagi and made for the Hiryu. “Seven enemy planes finally succeeded in launching their torpedoes at Hiryu. Our Zeroes tenaciously pursued the retiring attackers as far as they could. Hiryu turned sharply to evade the torpedoes and we watched anxiously to see if any would find their mark. 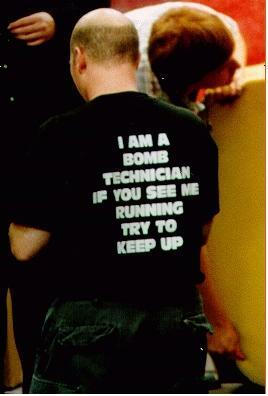 A deep-sigh of relief went up when no explosion occurred. “Preparations for a counter-attack had continued on board our 4 carriers. 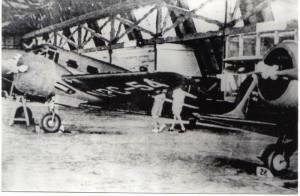 One after another, planes were hoisted from the hangar and quickly arranged on the flight deck. There was no time to lose. 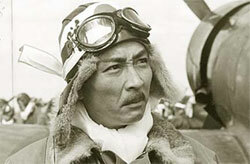 At 1020, Admiral Nagumo gave the order to launch when ready. Five Minutes! Who would have dreamed that the tide of battle would shift completely? Visibility was good. Clouds were gathering at about 3,000 meters. At 1024 the order to start launching came from the bridge by voice-tube. The Air Officer flapped a white flag and the first Zero gathered speed and whizzed off the deck. “At that instant a lookout screamed: ‘Hell Divers!’ Some of our machine-guns managed to fire a few frantic bursts at them, but it was too late. The plump silhouettes of the American Dauntless’ quickly grew larger… Bombs! Down they came straight toward me! I fell intuitively to the deck and crawled behind a command post mantelet. [mattresses]. “The terrifying scream of the dive-bombers reached me first, followed by the crashing explosion of a direct hit. There was a blinding flash and then a second explosion, much louder than the first. I was shaken by a weird blast of warm air. 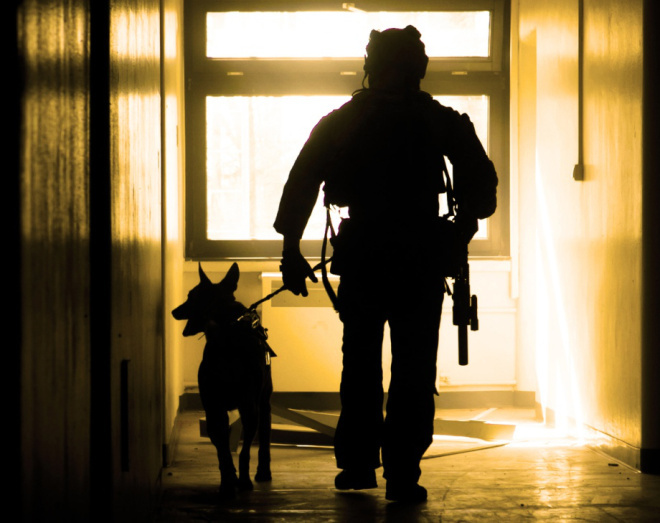 Then followed a startling quiet as the barking of guns suddenly ceased. 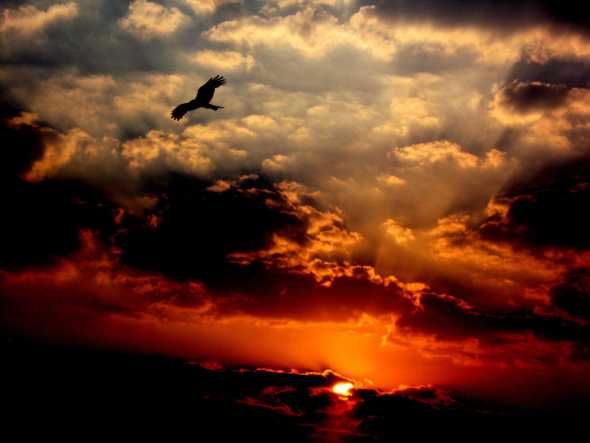 I got up and looked at the sky. 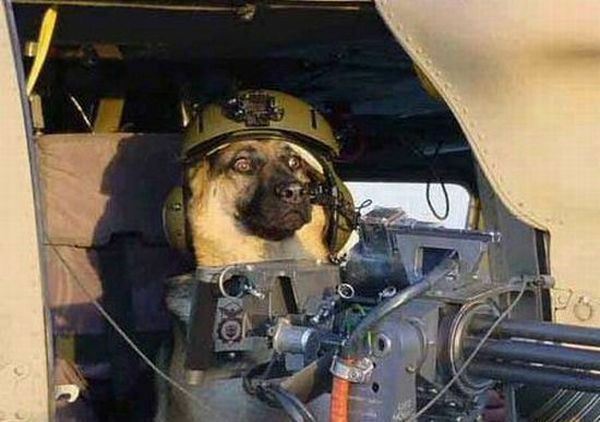 The enemy planes were already gone from sight. “It may be said that the American dive-bombers ‘ success was made possible by the earlier martyrdom of their torpedo planes. We had been caught flatfooted in the most vulnerable condition possible – decks loaded with planes armed and fueled for attack. 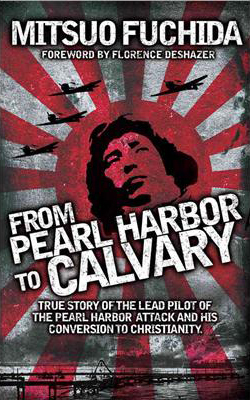 Captain Mitsuo Fuchida survived WWII and returned home where he became an author. At the age of 73, he passed away on 30 May 1976. FDR using his own troops to flex his muscle and boost his reputation. Raymond Ireland – Hawera, NZ; WWII, # 249252, SGLMN, 3rd Div. Evelyn Stein – Fairbanks, AK; USMC, Woman’s Marines, WWII, Cpl. Our fellow blogger at Cool San Diego Sights has offered the readers here to take photos of any plaques you wish when he visits the Mt. Soledad Memorial. 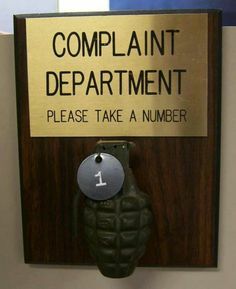 Please visit his comment below for details. I missed Woman’s Day last Sunday, so here is a wonderful Tribute for Rear Admiral Grace Murray. In an interview with Rear Admiral Grace Murray Hopper in the 80s, David Letterman asks her how she knew so much about computers at the time. Her response? The audience explodes with laughter. Hopper’s honesty and quick wit shine at that moment. For a woman who didn’t know much about computers when she first entered the Navy Reserve, Hopper made tremendous advances in the world of computer programming. She left her position as a professor at Vassar College and entered the Navy at 37-years-old.She was one of many women who joined the WAVES (Women Accepted for Volunteer Emergency Service), a program created in 1942 calling for women to join military personnel during World War II. 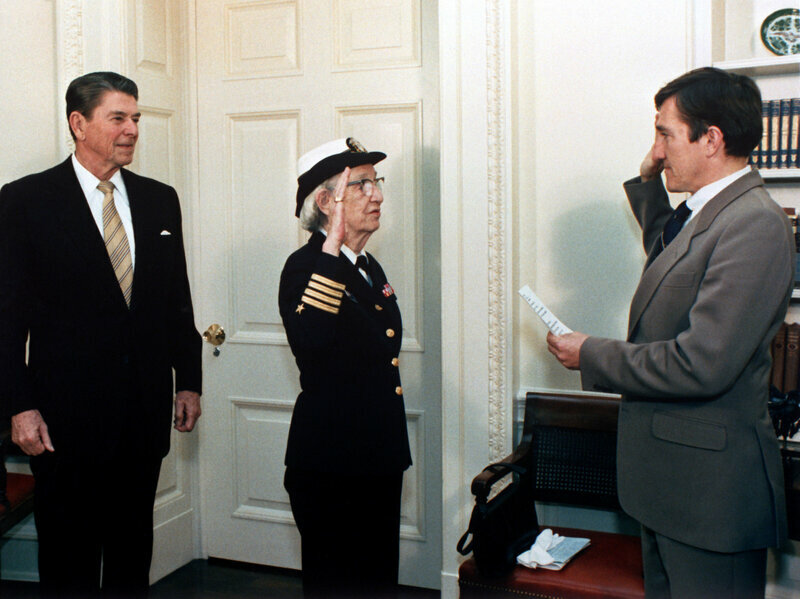 While in the Navy she worked on the first programmable computer in the United States, Mark I, at Harvard.